THIS GIVEAWAY IS NOW CLOSED. KERRI FROM HAPPY TUESDAY WON! CONGRATULATIONS KERRI. With the new year being just weeks away, I thought now would be a good time to host this giveaway! 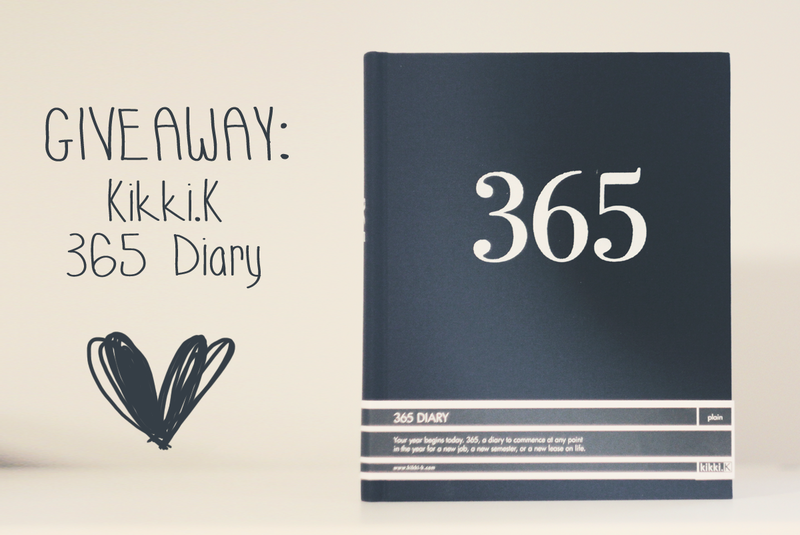 If you win, you will receive a brand new 365 diary from Kikki.K! I have a red one myself and love it as you can start at anytime because it's not dated. To be eligible for the giveaway you must be following my blog either on Bloglovin' or google (which you can join below) and then leave a comment on this blog entry with the link to your profile so I can check. The winner will be randomly selected in one week's time - next saturday (AEST - 21 December). I will contact the winner to get their address and ship it out to them. This giveaway is available internationally. Such a great giveaway! Hope you win :)!!! I would love this journal! Thanks for this giveaway! Looks you're a bit like me: crafty, dreamy, nostalgic. :) It's nice to meet you! I've been eyeing this book for a long time but just not sure if I'll have the motivation to do so daily ! Thanks for the giveaway Erin! I love paper journals. This looks lovely. thank you! Thanks for the giveaway, I would love to win this diary ! Ooh, a giveaway! I'm in!